COULD BE SAID THAT DRAPING FABRICS ON A BODY OR MANNEQUIN IS WHAT VIVIENNE WESTWOOD SAID “LEARN ACTING”. 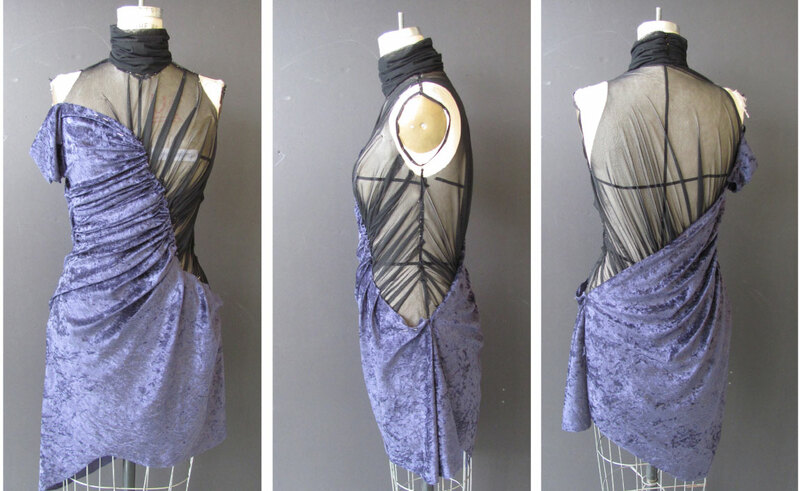 First of all Draping must also have to do with creating ideas directly on a mannequin. Draping is a technique that has been used since a long time in the past. The great dressmakers of the history uses that technique to create different silhouettes. It describes as a process similar to sculpt the body with fabric. Who do they create those silhouettes? Creating volume. Then we have that to create a volume in fashion have to be excess of fabric on the garment. It says that a garment have volume when it doesn’t suits on the curves of the body, instead designers and dressmakers create a new silhouette. So designers such Viktor and Rolf for example influences on techniques of draping and moulage. And the applications to their sketches for a design. More over it is used for the designers over the mannequin with a toile or muslin recreates garments. Moulage and draping is a process to create pattern and shapes for the garments.Likewise it consists in manipulates tissue directly on a mannequin. Bending, folding, wrinkling, and place a cloth in a three-dimensional support allows the designer to work with more complex forms and techniques. It is often very difficult to develop or cut flat patterns. To drape a fabric and create a design the pattern help is not necessary. However the pattern creates with the fabric on the mannequin, marked with dry pen dashes over the body of tri-dimensional. Virtual person creates the pattern on a plan fabric such a muslin or toile. A fabric covering is a part of a design process. This process can create new ideas for research, and that can not be able to create with the sketch alone. Extract abstract forms from the elements inspire and explore its potential on a mannequin is a much more expressive way to develop ideas for garments that only draw. Also this technique helps the designers to understand better the sketches by tri-dimensional helps on a mannequin. The word itself speaks drape fabric folds and movement, so it is essential to possess a basic knowledge of the qualities of the fabrics. Quality, fall, structure and malleability of a fabric represented on the mannequin play an important role both in appearance and in its result during the modeling process and draping. The draping is done on a mannequin that acts as a body. Placing a thin ribbon fastened by pins outlining the seams or lines of the body. You must choose a fabric cut straight or bias. That is necessary to select before if you are going to design a garment with a fabric fall. Probably it could be muslin or toile. This fabric cuts as a square with dimensions 35 per 35 inchs for example. Fixed by pins on the right side of the dummy, as you prefer. Similarly the fabric you should note from the center point of the neck to the waist if you are going to create a simple basic blouse. Finally secure it with pins the center of basic blouse. Always mark the center of the bust. Hold from neck to waist. Shape the bust side using tweezers. Cut excess tissue through small cuts. DRAPED OR MOULAGE ACHIEVED SHAPES AND VOLUMES THAT CAN BE ENDLESSLY CREATED. Princess Cut Blouse: Do it yourself Hacks! The trick is getting a one-dimensional piece of fabric to conform to a multi-dimensional human body that also fits the body well through the hip, waist and bust or chest lines. This is what differentiates the good designer from the great designers.